Grateful Blog: Day 98: Last night was Passover. I celebrate it every year but not because I’m Jewish but because my dear friends are and I’ve been honored to have been invited to celebrate that Holy night with them for 15 years or more, as long as I can remember. It’s a special night, as much for the ceremony as for the company of friends. Our host calls it the ‘Jewish Thanksgiving’. Others call it the Last Supper. I’m just Grateful to be part of it. The thing is, we read the story of the Exodus, in which the ancient Israelites were freed from slavery in Egypt. In some ways the story is specific and in some ways universal. There was a passage in the book that we read from, the Haggadah, where it says something to the effect of ‘standing up against injustice and celebrating freedom’ and it was beautiful and I wish I could remember it because it a manifesto of sorts not only for the Israelite slaves in Egypt but for people everywhere. When you celebrate a tradition that is thousands of years old and realize that their hopes and dreams were no different than ours, one begins to have a greater appreciation of why we struggle with the difficult questions of modern day life, and how the against the backdrop of history our answers must be informed. Then of course there are the rituals: The bitter herds, the unleavened bread or matzah, the lamb and the four cups of wine. I won’t pretend to understand the theology behind the Jewish faith or any faith for that matter, but I do know this, a faith that celebrates by inviting their close friends to partake in their sacred holiday is a blessing, for the food, the company, the atmosphere and the window into the past and the future. It’s simple, ancient, and unpretentious and I’m Grateful to once again have been part of that. The nicest moment of the whole night was when our host, my friend Dennis, went around the table and spoke from his heart to each and every one of us, to why they were special to him. It was unscripted and there wasn’t a dry eye in the room. There’s that thing, that anticipation when you know your turn is coming and you suddenly begin focusing in a deeper way than you ordinarily would and there’s a palpable feeling that overtakes you. Call it ‘being present’ or just being alive and fully in the moment. Anyways, it was like that. It was inclusive, heartfelt and special beyond the words I could type. I don’t care what religion or God any my friends believe in. I believe in them and we believe in each other. Passover’s like that for me, an affirmation that we are all one as a people, no race, no creed, no nationalities or boundaries. We’re ALL wandering the desert the desert trying to figure out the meaning of our lives and what happens next. On Passover, surrounded by friends, there’s no need to wonder or worry, the moment and the celebration is enough, and Moses parting of theRed Seais just the icing on the cheesecake. 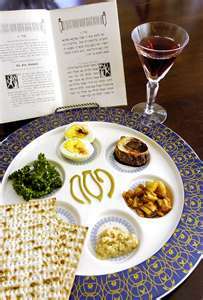 This entry was posted in Uncategorized and tagged Egypt, Exodus, Haggadah, Jewish, L'Chaim, Last Supper, Matzah, Passover by Dan Weber. Bookmark the permalink. Nicely written, Dan. My sentiments exactly. It sounds like it was a meaningful night for you. Nice!